Bouchon is Chef Thomas Keller’s LA outpost. Bouchon is located on Canon in Beverly Hills, and it is just two blocks from the disastrous (for burgers) The Farm of Beverly Hills. Parking was free in the garage directly below the restaurant. Fat Bruce Lee, myself, and company were seated immediately for lunch, and our waiter was very knowledgeable about the menu. The Beef: The beef in the Bouchon burgers was a finely ground blend of Chuck, Brisket, and Sirloin. The grinding of the beef was done on site. Once ground, this beef was simply left alone. The patties were flavorful with powerful notes of beef from the Chuck, complex mineral flavors from the sirloin, richness from the fat in the Brisket. Also present was a gentle end note of funk from the aging. The beef was juicy without being greasy. It should be noted, however, that the beef was so finely ground that it was difficult to differentiate the mouth feel of the beef from the bun or the cheese. This created a tuna casserole feel, in terms of texture, which detracted from the obvious quality of the ingredients. The Sear: There was no sear. A sear would have been a winner here. This burger was flavorful and beefy, but it was lacking in texture. While the low and even temperature style of cooking was technically impressive, it fell flat in terms providing an interesting and expected shift in texture to the dish. However, the eggs on the Croque Madames that were being delivered to the tables around us benefited greatly from an application of this same cooking technique. We, ladies and gentlemen, are not the Croque Madame Busters. The Seasoning: This was ample and even. 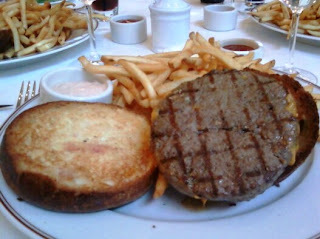 The seasoning on the cheeseburger at Bouchon was absolutely perfect. The Preparation: The freshly and finely ground blend of beef was gently formed into large, thick, even, flat patties. The patties were gas grilled to Med-Rare, but at such a low and even temperature that no sear/Maillard reaction took place except at the very edges and where the grill made intimate contact with the patty—even this was negligible. The sirloin in the blend should have been ground far more coarsely so that there was something to chew on—a burger that contains steak should feel like a burger that contains steak. Too much “melt in your mouth” can lead towards a feeling of blandness. This was completely discordant with the strong flavors that wove their way through the dish. The Cheese: This was a booming Yellow, Aged, Vermont Cheddar. The cheese was a monster. It was dangerously close to overwhelming the burger with its strong notes of salt and iron. The cheese was aged to the point where salt had formed crisp crystals throughout, and this created a grainy mouth feel. Unfortunately, the finely ground beef and the brioche bun had similar grainy textures, so there was little contrast in terms of mouth feel in this cheeseburger. This was not the fault of the cheese. This cheese was marvelous. The Bun: This was a dryish but very tender, mildly sweet, toasted brioche. The house-made brioche dough was so gently manipulated that the final product was crumbly—like a fluffy scone. A little chewiness would have been welcome to contrast with the cheese. The Meat to Bun Ratio: There was too much bun. I put the top of my bun aside , and found the burger to be much improved in terms of meat and bread balance. Honestly, the meat and cheese were so flavorful that this would have been fine without a bun. The bun was simply along for the ride. The Fries: The shoe string-style fries were cooked in fresh peanut oil-—fresh enough to infuse the fries with a strong and satisfying nutty flavor. 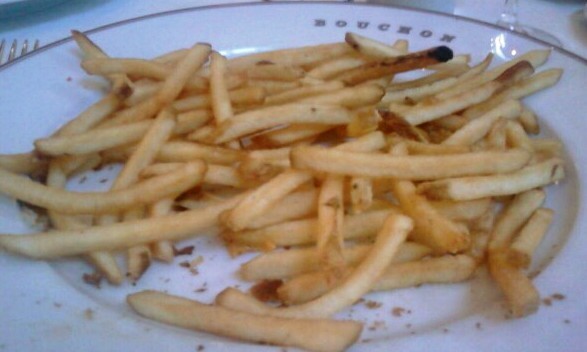 The fries were crisp, golden, and properly seasoned. The fries were fantastic, and it was difficult to stop grazing on the generous portion that accompanied each burger. The Value: Three of us dropped $30 each on a cheeseburger, a soda, and fries. The ingredients were spectacular. Even the tomato slices and bib lettuce that accompanied the burgers were perfect. It was clear that quality ingredients were a priority at Bouchon, and they were only in the business of accepting the best of what their purveyors had to offer. Still, $30 was a lot to spend on a burger lunch. 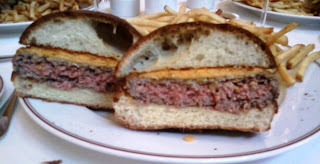 The value was not as strong as the deliciousness of the burger at Bouchon. 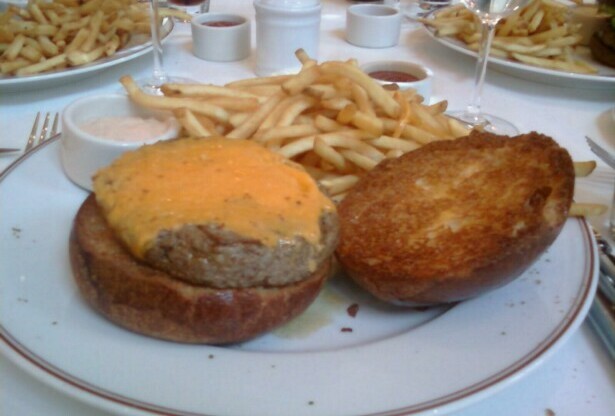 Chef Keller, we thank you for having focused your burger acumen on Bouchon and Bar Bouchon in Beverly Hills. Burger Review : A pricey but almost magnificent burger was enjoyed at Bouchon. The flavor was marvelous, but the lack of sear and the grind of the beef held this burger back from achieving excellence. Nice review, but Burger Bar is the brainchild of Hubert Keller, not Thomas Keller. And no relation. Have you guys ventured over to Spago to try their burger yet? I heard it's good too. Doh! Thanks for the correction--I don't know why I can't keep them straight in my head. Spago is now on the list.